Your portfolio can be well served by looking at successful investors and adopting some or many of their strategies. We all want our portfolios to grow as briskly as possible, and every time we make a bone-headed move, causing our nest eggs to shrink or falter in their growth, we may wish we were better at investing. We would all be well served by looking at successful investors and emulating them. Here are three habits of smart investors. See which of them you can adopt. Brian Feroldi: It's easy to claim that you're a long-term investor when the markets are bullish. After all, it's great to be able to log in to your brokerage account and see that your net worth has gone up just for because you held on to your stocks. However, all too often these same investors go into panic-selling mode when the market hits an inevitable speed bump, believing that they will be able to buy back in at advantageous prices once things calm down. In essence, these investors unknowingly become market timers, which studies show is a poor way to invest. So what do the smartest investors I know do during times of distress? They invest more money when the market tanks. It's counterintuitive and hard to do, but if you truly are a long-term investor, then it's a great way to generate superior returns. These smart investors understand that it's perfectly natural for markets to decline sharply, often for no reason at all. That's why they develop an action plan before the volatility takes place, giving themselves flexibility to take advantage of lower prices. Fool One analyst Morgan Housel has shared his cash investment strategy for when the market falls. He has a simple table that he follows whenever the market takes a dip, eliminating emotions from his decision-making process. This is a really great idea and I've since adopted his method as my own, since it allows me to make calm, rational decisions during times of economic chaos. Historic data shows that, on average, the stock market declines about 10% from its recent high every 11 months, and 20% drops occur about every four years, on average. That means a big market drop will likely occur in the not-too-distant future, so I'd suggest developing a game plan of your own now, so you can take advantage of future market volatility. Fees can make a big difference in your results. Image source: Pixabay. Selena Maranjian: Here's one thing that smart investors do that might surprise you: They pay attention to the fees they're charged and they aim to pay as little as possible in fees. For starters, they may patronize brokerages that charge relatively little per trade -- though they'll also likely trade infrequently, making the commission cost not a paramount concern. While some brokerages might charge $25 or more per trade, others charge just $7 or $10 per trade. If you trade twice a month for 10 years, a $15 difference in your commission fee can amount to $3,600! Even more powerful is keeping any fees you pay annually as low as possible. If you want to invest in the S&P 500, for example, there are gobs of mutual funds and exchange-traded funds (ETFs) to choose from. You might opt for the Wells Fargo Index (NASDAQMUTFUND: WFINX) fund, for instance, or the SPDR S&P 500 ETF (NYSEMKT: SPY). While the ETF charges an expense ratio (annual fee) of just 0.09%, the Wells Fargo fund charges 2.00% or more, thanks to a 1% annual load, a 0.75% 12b-1 fee, and a 0.25% shareholder service fee. that's a difference of 1.91 percentage points, which might not seem that terrible -- but it is. Here's why: Imagine that you invest $100,000 for 20 years and it grows at 10% annually. After 20 years, you would have almost $673,000. Of course, if your money were in a fund, you'd be forking over annual fees that would decrease your return. In the Wells Fargo fund, a 10% average annual gain would be reduced to just 8% or so, while it would fall to 9.91% in the ETF. What does that do to your results? Well, your end result in the Wells Fargo fund would total just $466,000, while you'd have about $662,000 in the ETF. Small differences in fees can make a huge difference to your results. Seek low fees in all your financial dealings, whether it's in your funds, your investment accounts, your 401(k), or your bank accounts. Boring stocks can be great performers. Image source: Pixabay. Matt Frankel: It may surprise you to learn how most stock market millionaires make their fortunes. They don't chase the next big thing or buy risky investments. Rather, they buy stocks that many people would consider boring and hold on to them for decades. Consider three stocks: Johnson & Johnson, Procter & Gamble, and Realty Income. None of these are particularly exciting. Johnson & Johnson is a mature healthcare company and isn't too likely to double its profits quickly, Procter & Gamble has a well-established product portfolio, and it doesn't get much less exciting than Realty Income's commercial real estate. However, all three of these companies consistently make money and grow their profits. 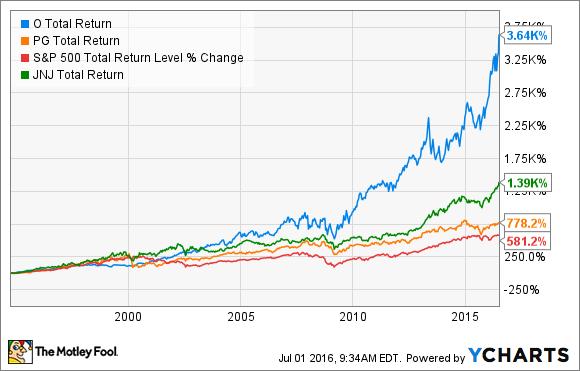 In fact, it may surprise you to learn that all three have handily outperformed the market over the past few decades -- and Realty Income has really beat the market. In fact, if you had invested $10,000 into each of these companies 20 years ago, or $30,000 total, you'd be sitting on a nest egg of more than $370,000. Now, not all boring stocks make great investments, but the point is that if you focus on companies that consistently produce modest growth, you're much likely to be a long-term winner than if you try to chase IPOs or trendy up-and-coming stocks. Spend more time reading about great investors and you'll likely find even more sound strategies that can help your money grow faster.